An indisputable part of implementing CAMBRA principles into your dental practice is the risk assessment. Measuring risk to correctly manage and mitigate cavity risk is the very heart of CAMBRA practice principles. The caries risk assessment form is an exceptionally valuable tool to help measure and quantify dental risk. But, a quick survey and internet search demonstrates that not all risk assessment forms are created equal. So, what are the essential elements that help make a caries risk assessment form really useful? It doesn’t really matter how comprehensive the questions are if they constantly require clarification or are regularly misinterpreted. Obviously, patients will need to answer questions about lifestyle factors and changes In Their overall health. They should be able to understand what is being asked of them without elaborate explanations every time. Questions that require clinical judgement should be straightforward enough that multiple practitioners would select the same or similar answers when examining a patient. If the form is subjective enough to lead to significant variation between practitioners, it is probably not useful for objective decision making. It’s good to have a form that lets you develop a risk category score simply and quickly. However, it’s definitely worth balancing speed with quality of information gathered. A form that asks highly specific yes or no questions can be written so that those questions collect overly limited information. If you find that your risk assessment often leaves you without a complete picture of your patient’s oral health, your form may be the cause of your break in doctor patient communication. You certainly don’t want to collect too little information from your patients with a risk assessment. A complete picture of your patient’s health lets you provide the best information tailored to your patient’s exact situation. However, patients also need to be able to supply information in a reasonable amount of time without feeling like they’ve just been interrogated for hours. A patient will give up on filling out an overly complicated form, which then necessitates your staff spending additional time asking those questions to the patients. Alternatively, you may find yourself skipping over questions your patients have skipped. If you really don’t need to collect that information, why are you asking it on your risk assessment? Caries risk, like most other health risk areas, is a continuum. If your risk assessment scores a patient only as high risk or not, it’s doing you and your patients a disservice. Patients at moderate levels of risk should consider different home care programs than patients at low levels of risk. Although too many categories would be wasteful, make sure your risk assessment isn’t using too few. 5- Helps patients make informed choices about their healthcare. At the end of the day, a risk assessment form isn’t a survey. It’s a tool to help you diagnose and recommend the right treatment to your patients. The risk assessment can be enormously helpful when discussing treatment options, since it gives you an organized and concrete way to cement the relationship between behaviors and risk factors with levels of intervention and expected outcomes. It can be an aid to help the patient understand why you recommend certain professional products over others. It can even aid a patient in goal setting by showing them behaviors they can choose to improve their dental health. A well developed risk assessment form can help the patient see not just what their current risk level is, but can help them see how to move down to a lower risk level. 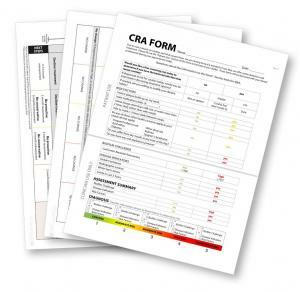 Evaluate your risk assessment, and see if you can help your patients better with a better CAMBRA focused caries risk assessment form.